This is not the most recent version. 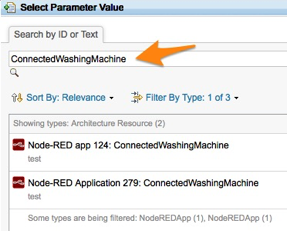 We recommend IBM Continuous Engineering Connector for IoT in Rational Engineering Lifecycle Manager 6.0.5.1 . This is made available for archival purposes and may contain bugs and/or security vulnerabilities. If you do download this version, it is being provided AS IS, without warranties of any kind, including the implied warranties of merchantability and fitness for a particular purpose. We strongly advise you review the support pages for this version and update the product or take actions recommended therein. Security bulletins contain instructions for the security vulnerability addressed therein, and may require upgrading to a newer version. Link to security vulnerability blog: IBM PSIRT blog. The Internet of Things (IoT) is driving businesses to transform themselves into connected, digital enterprises to take advantage of new opportunities for optimizing operations, increasing customer engagement and loyalty, developing new revenue streams and business models, disrupting existing markets, and innovating faster with an IoT feedback loop that informs business and engineering leaders. Clients recognize that they need to be the disruptors in their industries ... or they will be disrupted. But being fast to market, which is challenging in its own right, is not enough. IoT solutions that interact with the physical world via sensors and actuators can cause serious harm, financial loss, or reputational damage if the solution fails to perform or performs incorrectly. Doing enterprise-scale transformations to realize enterprise-level business value requires enterprise-appropriate systems and software engineering processes. IoT solutions have many components which typically are hosted on multiple runtimes and developed by multiple teams. Coordinating across these teams while designing, building and evolving an enterprise solution is especially challenging. IBM IoT Continuous Engineering (CE) tools and practices can be employed to design and build dependable enterprise IoT solutions. This technical preview enables teams to extend their development practices to include the teams building IoT solution components using the IBM Watson IoT Platform. 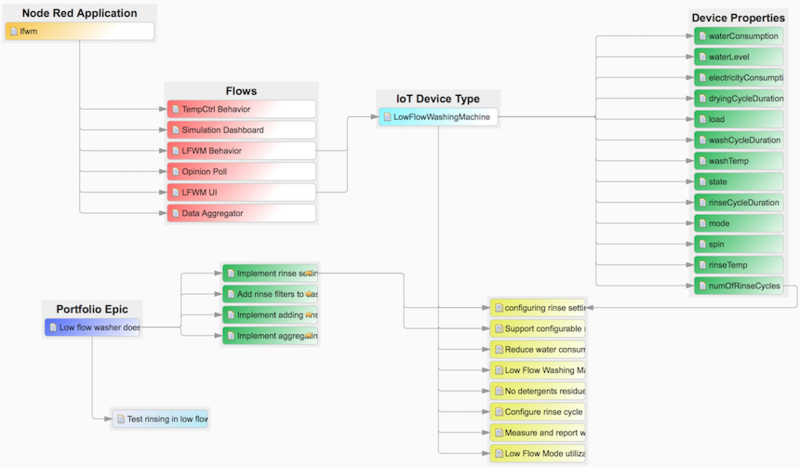 CE4IoT enables you to work with a design view of your IoT solution, including devices, rules and Node-RED flows. This design view enables you to link these platform artifacts to any other element in the Rational Continuous Engineering solution including requirements, work items, test cases, and UML or SysML model elements. It also enables you to use Rational Engineering Lifecycle Management (RELM) for traceability and impact analysis of potential changes to your IoT solutions. With CE4IoT you can make use of Continuous Engineering capabilities when developing enterprise-level IoT solutions. CE4IoT makes this possible by placing objects in IBM Rhapsody Design Manager that represent IBM Watson IoT Platform resources, enabling them to participate in change management, impact analysis, requirements-driven development, requirements-driven testing and other common development practices. These objects include links to the actual resources in the IBM Watson IoT Platform and Node-RED, simplifying navigation between these environments. The Continuous Engineering solution runs in the Cloud or in your data center. See the discussion in the Installation Guide for considerations related to deployment and firewalls. IoTPPublisher.java runs in the Continuous Engineering environment. It contacts iotCEAdapter requesting information about the resources available in the IBM Watson IoT Platform and Node-RED application. 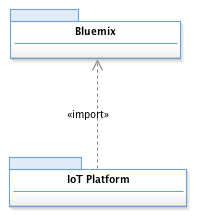 iotCEAdapter runs in an IBM-hosted Bluemix organization (1). 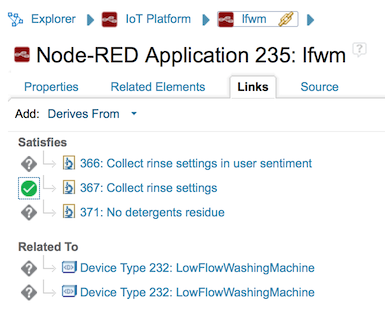 This server queries the IBM Watson IoT Platform and Node-RED application to discover resources of interest (device definitions, rules and Node-RED flows). Your IBM Watson IoT Platform and Node-RED instances run in your own Bluemix organization (2). IoTPPublisher.java identifies new or changed resources and updates the objects in IBM Rational Design Manager representing these resources. Once the IoT resources are represented in the Continuous Engineering solution, you can use existing CE capabilities and engineering practices. The IoT Platform Domain defines a design-level view of Watson IoT Platform resources in IBM Rhapsody Design manager. This view provides an abstraction of the IoT Platform organization and application implementation details in order to facilitate the design and lifecycle management of your IoT devices and Node-RED flows. The IoT Platform domain defines the analysis and design artifacts that can be integrated with other lifecycle management artifacts including requirements, work items, test cases and other UML or SysML model elements. 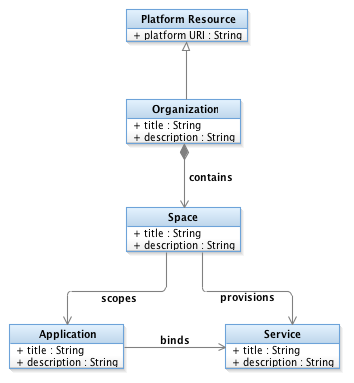 The Bluemix ontology covers design artifacts that are common to all Bluemix projects. A Bluemix Organization establishes the unit of organization and user management for the Spaces that it contains. Spaces can be used to scope applications and provisioned services for different purposes or lifecycle phases. For example, a typical organization might have different spaces for managing different lifecycle phases such as development, testing, preproduction and production. Applications represent the deployed instances of the Bluemix runtime platform with its bound services. Applications typically have routes that provide access to the running application. All of the Bluemix classes, and many of the Watson IoT Platform artifacts described below specialize Platform Resource which provides a platform URI property that supports direct navigation from Design Manager to the represented Watson IoT Platform resource. 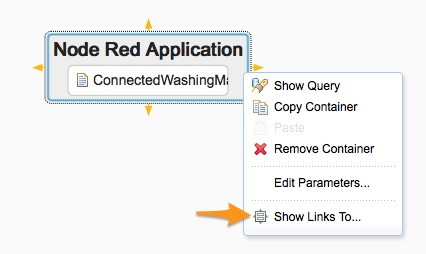 Note: this technical preview imports Node-RED applications from Bluemix. The Bluemix organizations, spaces, and other applications and services are not currently included. 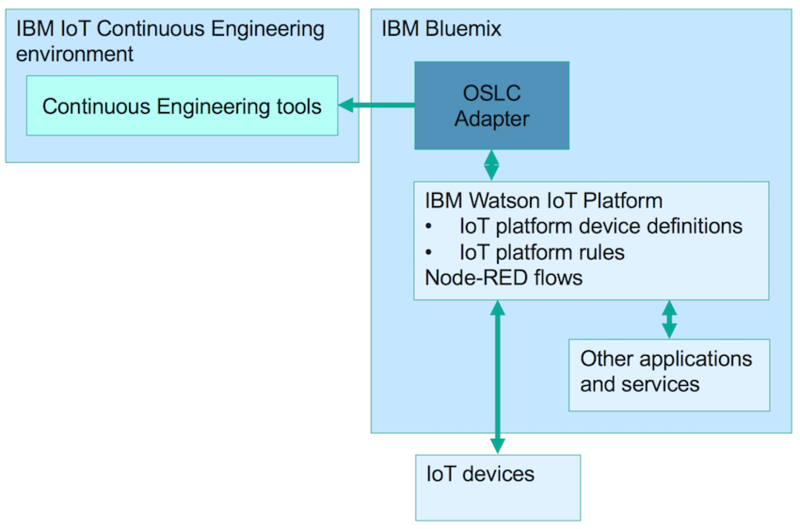 The IoT Platform ontology extends the Bluemix ontology with artifacts that represent design artifacts derived from Watson IoT Platform devices and applications. IoTP Organization extends Bluemix Organization to address IoT Platform specific properties. Like a Bluemix Organization. IoTP Organization is the unit of user management. An IoTP Organization manages Device Types, each with their own Device Properties. Device Type and Device Property classes abstract the Watson IoT Platform device type and device schema elements. A Device represents an instance of a Device Type, and something that would be deployed to the Watson IoT Platform to collect real-time data. The IoTP Organization also manages Rules for real-time analytics. A Rule has a condition property which is a string representation of the RTI rule condition. 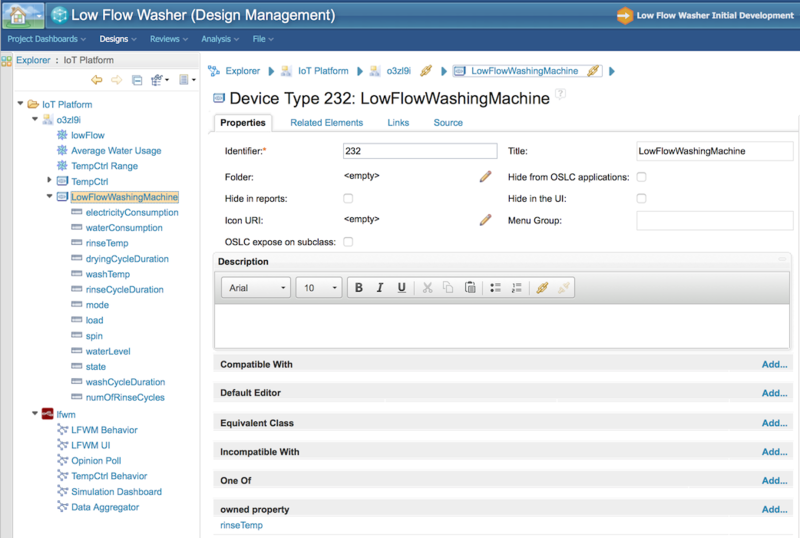 The design view enables you to see and manage dependencies between the rules and the devices they reference. 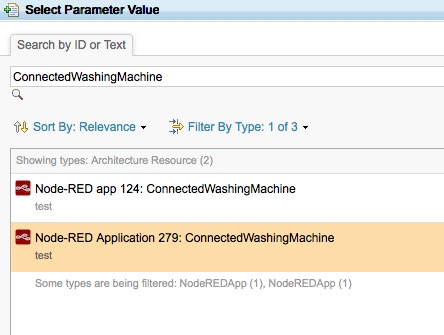 A Node-RED Application is a specialization of a Bluemix Application and represents the Node-RED applications in a Bluemix organization. This allows you to manage the dependencies between your Node-RED flows and the devices they use. The figure above also shows the Design Manger Properties tab, which can be used to view the details of the selected artifact. Note that these artifacts are read-only in the technical preview. In order to use CE4IoT, you must first create and configure the appropriate project areas. You must at least create one Design Management project area for administration of the Connector properties, for example, called IoTPubConig. Additionally, you need to create or reuse one or a set of related project areas for other lifecycle artifacts including requirements, work item and test cases, and designs. The easiest way to do this is to create a Lifecycle Project using the Quality Professional, Analyst, Developer - with Design Management template, which will create and associate all the required project areas so that you can create links between the different lifecycle artifacts. A Lifecycle Project simplifies user management; you can add users to all the associated project areas in one step. Note however that you will still need to manage each project area to assign project roles in order to establish the appropriate permissions. Click the Set Versions to Latest Baselines button, then click the OK button to set the version of the IoT Platform Domain to the latest baseline. All the project areas for you need for lifecycle management of your Watson IoT Platform artifacts are now created, configured, and ready to use. Make sure you have your lifecycle project areas set up and that the user id you will use for publishing has read-write access to the Design Manager project area (the pre-defined Architect role is sufficient). This project area must be associated with a specific version of the IoT Platform Domain. The design manager project area the data is published to is called "target project area"
To access the information from your instance of the Watson IoT Platform you need to have an API Key and Token. You need to ask for RTI API keys in order to read the RTI rules as well as the device schemas. Until you get the keys you will not be able to read the device types from the Watson IoT Platform. As of December 2016 this is a manual process. To request RTI keys contact your IBM representative (you will need to specify your Watson IoT Platform organization ID). IMPORTANT: To avoid data corruption, make sure to stop any running IoTPPublisher processes before creating or changing the configuration. 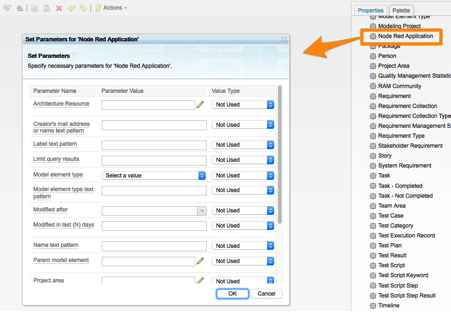 Node-RED app Adapter URI: the name of the IBM-hosted CE IoT adapter (Bluemix iotCEAdapter project). Typically should not be changed unless the iotCEAdapter has been deployed someplace else. rtiKey and rtiToken: the RTI Key and Token if you have them. Save the IoT Project Area settings. Now that Watson IoT Platform data is in your Design Management project area, you can use this information to manage the lifecycle of your IoT artifacts. Although the artifacts are different, lifecycle management of IoT artifacts is not that different than lifecycle management of similar analysis and design artifacts that can be created using IBM Rational Rhapsody. 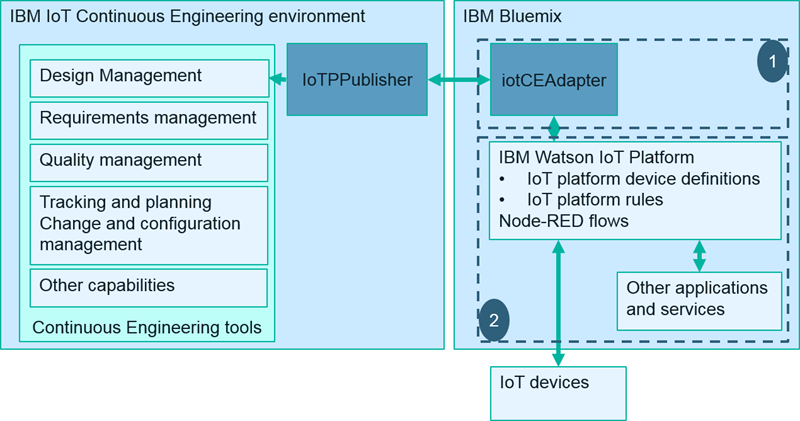 The Continuous Engineering (CE) lifecycle management capabilities can be used to facilitate the design and implementation of your Watson IoT Platform applications. These same capabilities can also be used to in embedded software development to deploy solution components to the Watson IoT Platform, expanding the scope of traditional Systems and Software Engineering (SSE) solutions to the IoT. It is beyond the scope of this user guide to explain the CE capabilities. Rather it is assumed that CE users are already familiar with these capabilities and this user guide will provide a summary of relevant aspects of Watson IoT Platform artifact lifecycle management. Administering an IoT platform design project is the same as administering any Design Management project area. The administrator opens the IoT platform design project area, and uses the Application Administration menu items to manage the project area, the application or users. Please note that the following administration topics are specific to project areas that use the IoT Platform domain. Additional details for setup administration are covered in the installation guide. Members added to the project area should have appropriate process roles and permissions. The Basic process template defines a number of roles. Typically the Architect role is used for analysis and design activities. In this technical preview, you can explore IoT platform design artifacts described in Introduction to the IoT Platform Domain using Design Manager dashboards, explorer, and properties views. 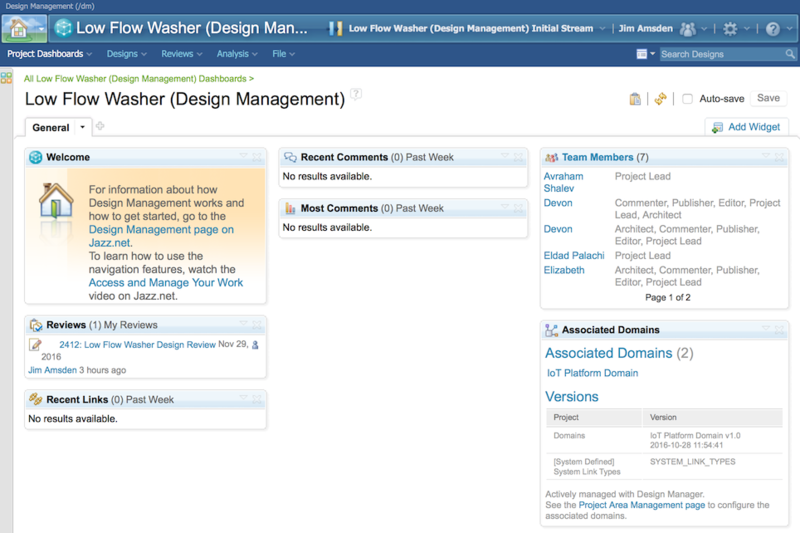 The Design Manager dashboard is the typical starting point for managing design artifacts. Like other Jazz applications, you can create project, team and individual dashboards containing widgets that are configured to support different stakeholder needs. Dashboards typically provide information about the design project, recent comments, pending reviews, team members and many other views. 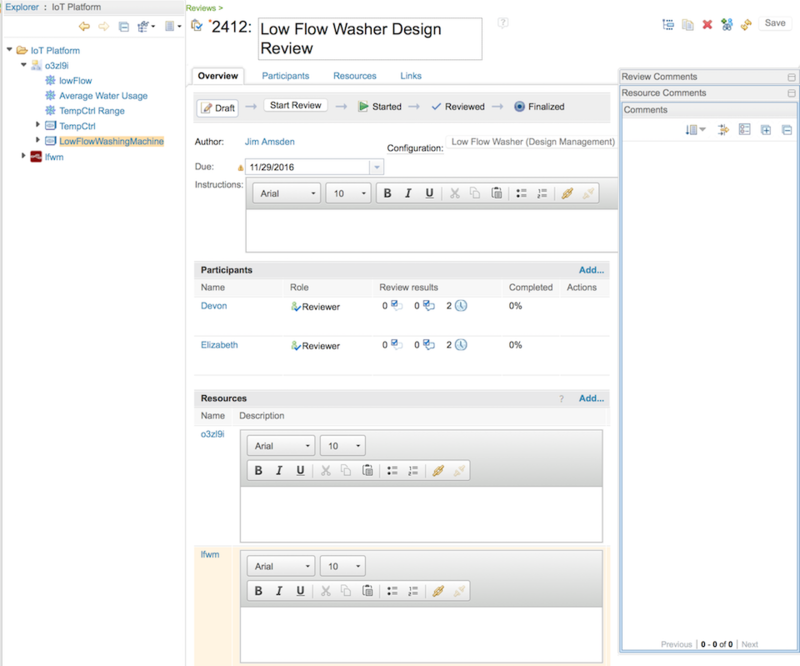 For example, the Low Flow Washer (Design Management) project dashboard shows the default widget views. Dashboards can include widgets that display information from any associated project area. You can create multiple tabs to organize lifecycle and design information to meet your specific needs. Notice that the Search Type is Explorer, and the explorer viewpoint is IoT Platform. The selection dialog is similar to the explorer list view described in the previous section. Search Type can also be set to Search to search for the desired artifacts, or Pinboard to show the artifacts that you added to your Design Manager pinboard. OSLC preview provides three different views, the first two of which are shown in the figure above. 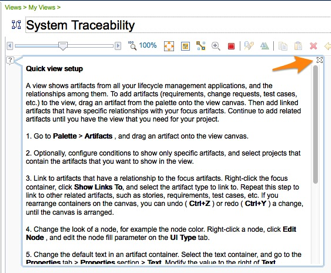 OSLC preview makes it easy to view linked artifacts across tools in order to understand their relationships. You can click on any of these artifact links to navigate to the artifact in the other tool. One of the primary drivers of continuous engineering is the management of change: change in the marketplace, change in requirements, change in the supply chain (dependencies), change in available resources, change in base technologies, change resulting from discovered defects, etc. Managing change is one of the primary purposes of the IBM's Continuous Engineering Solution. CE enables collaborative interaction across the whole team and across the whole solution delivery lifecycle to maximize the positive impact of change while minimizing its negative impact. The primary means of managing change is through comprehensive change and impact analysis across the lifecycle. CE provides a number of ways to manage change, from fine-grained impact analysis in individual tools to comprehensive impact analysis across tools using RELM. Individual tools often provide their own fine-grained traceability and impact analysis capabilities. Impact analysis in these tools often extends only to the "edge" of the tool. 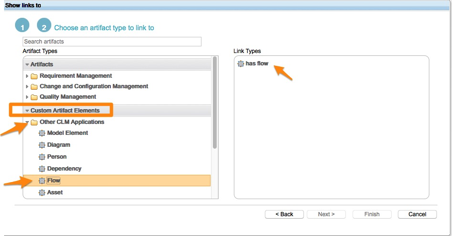 That is, the tool can show traceability between its managed resources and links it knows about to resources in other tools, but it cannot navigate beyond these links into the resources managed by other tools. Rather this is what RELM provides. Individual tools provide additional details supporting richer impact analysis of changes to resources the tool does manage, since each tool knows more about the resources it manages and has greater access to them. This view shows the numOfRinseCycles device property is selected so that the view is positioned to show the focus element, LowFlowWashingMachine and the selected property. This helps you zero in on the model elements whose change you want to explore. 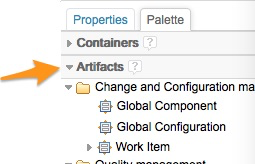 See Analyzing the impact of change on designs in the Design Manager documentation for further information. Design reviews are a good way to ensure the whole team understands the potential impact of proposed changes to and from design elements. Like RDNG, Design Manager supports the creation of explicit reviews. A review has a name and instructions to the participants performing the review. You can add review participants and assign them Reviewer, Approver, or Subscriber roles. You can then add specific IoT platform design artifacts to the review to tell reviewers what they should focus on. Reviewers can open the review, review the resources, and provide comments on the resources themselves, or in the review. There are a number of ways to find and report on IoT platform design resources. The simplest is to use Quick Search which allows you to do simple text searches on design artifacts. 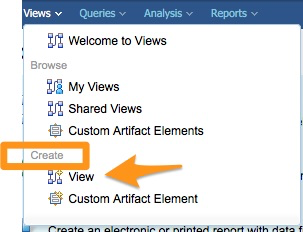 Design Manager supports the creation of reports using Rational Publishing Engine report templates. 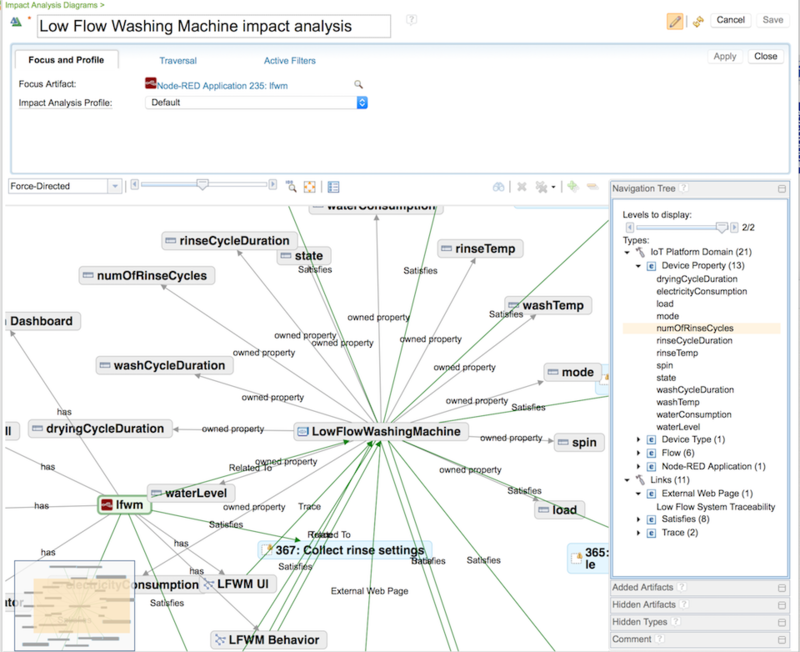 Design Manager also contributes resources to the Lifecycle Query Engine which enables the use of the Jazz Reporting Service to build queries and create reports on not only IoT platform design artifacts, but also including other lifecycle artifacts contributed by other tools. Note: Jazz Reporting Service support for Design Management in in technology preview for CE 6.0.3. Therefore this feature is not available for this version of the CE4IoT technical preview. The CE products support versioning and configuration management for many lifecycle artifacts, not just source code. Local and global configurations allow you to create versions of artifacts linked to other artifacts including your IoT platform design. This facilitates strategic reuse, product line engineering, parallel development, and controlled change management of your solution. This version of the CE4IoT technical preview enables your IoT design views to be versioned and contribute to global configurations. Note however that this does not support or involve versioning and configuration management of the Bluemix IoT platform resources themselves. 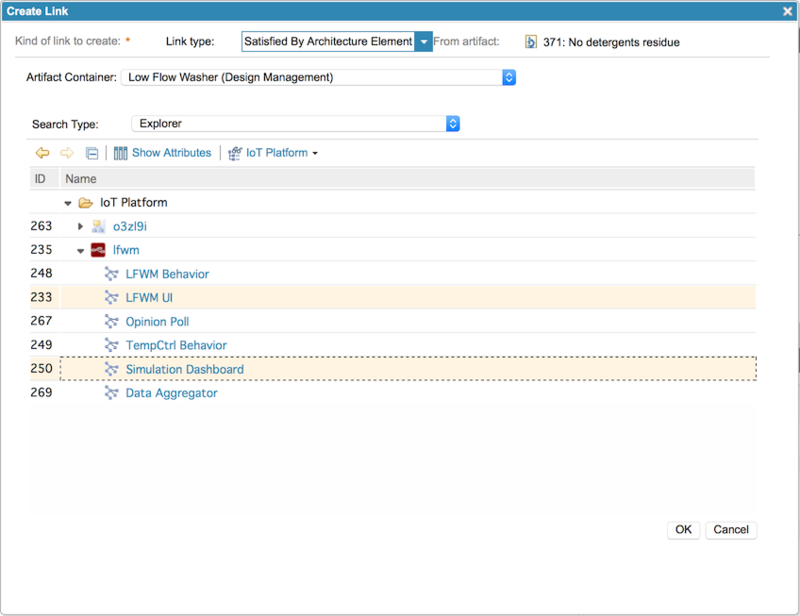 That is, you can version the design views and create baselines to preserve configurations of the design views by enabling configuration management on your IoT platform Design Manager project areas. However, this does not version the actual Watson IoT Platform artifacts from which the design views were extracted. Rational Engineering Lifecycle Manager (RELM) helps teams manage the complexity of IoT systems and solution development. RELM enables users to create queries and views that span across CE products in order to perform system-wide, full lifecycle traceability and impact analysis. The CE4IoT technical preview enables you to use RELM capabilities to include your IoT design artifacts in traceability and impact analysis. With RELM you can construct the specific queries and views that support your particular needs. With CE4IoT you can also include your IoT platform artifacts with RELM in order take a design centered view of traceability and impact analysis. That is, you can look at potential changes in your solution design, and determine what requirements and test cases might be impacted, what other IoT design artifacts might need to change, and what work will need to be done to complete the change. You can also look at the impact that changes in requirements might have on IoT platform design artifacts. 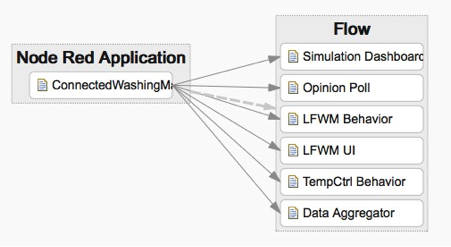 In this view you can see the flows in a Node-RED application, the device types they use, the properties of that device type, the requirements a change in the properties implement, the work required to satisfy the requirement, and how the result will be tested. RELM can be used to create many types of view. 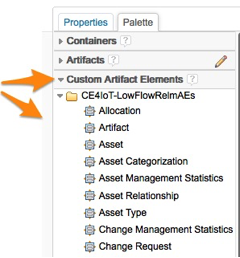 What follows is a simple example of how to go about using the CE4IoT custome artifact elements you imported. NOTE: Your server will only have one - this screenshot was from a sandbox where there were multiple instances of the demo staged. Other connected elements may be added in the same way. Lines, fonts, colors and so on can all be modified to create a pleasing view - see the RELM training for more details. Tailored solution offerings that match the problem space and end user skill levels.